This handbook covers the diagnosis, etiology, and treatment of conditions affecting the locomotor system in small animals. The 4th edition presents up-to-date information on various types of fractures and methods of fixation, lameness and joint surgery, and musculoskeletal diseases. Other key topics include: acute and chronic bone infections; transplantation, plating, wiring, and pinning techniques; bone grafting; reconstructive joint surgery; and osteochondrosis. Step-by-step line drawings clearly illustrate different types of fractures and demonstrate the surgical procedures used to affect repairs - detail that can't be conveyed in clinical photographs. NEW! Advances in joint surgeries, specifically the knee, shoulder, and elbow, keep practitioners abreast of the latest technology and best practices. Twenty-three years have passed since publication of the first edition of this book and the fourth edition takes advantage of considerable worldwide experience in this field. 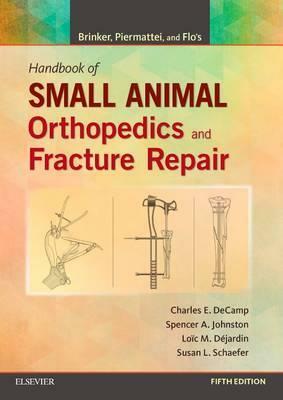 Many veterinary surgeons already know this comprehensive textbook and have had an opportunity to appreciate its usefulness in daily practice when managing all types of orthopaedic problems. The format of the book is the usual one, as in the previous editions, with a first part dealing with the basic principles of the diagnosis and treatment of fractures, lameness and joint diseases, including fracture classification and all types of implants and systems of fixation. The second part describes the treatment of fractures and orthopaedic conditions of the fore- limb, while the third part considers the hind limb. The fourth part describes the approach to other fractures and to reconstruction of bone deformity, whilst the fifth part deals with miscellaneous conditions of the musculoskeletal system. This edition is considerably enriched by the excellent artwork of F. Dennis Giddings, the artist who first become famous with the milestone book for all orthopaedic surgeons, Piermattei's Atlas of Surgical Approaches to the bones and joints of the dog and cat. The approach to each musculoskeletal condition is very comprehensive, following the original philosophy of Wade Brinker, taking care in the description of the pathology, the diagnostic work-up, surgical indications and planning, surgical approach, surgical techniques, complications and follow-up. For this reason this textbook is very useful to all veterinary surgeons when approaching veterinary orthopaedic and traumatology problems and willing to find the technical solution to any musculoskeletal case they may find in their daily practice. For more experienced surgeons, already used to consult the previous editions, this fourth one will update their knowledge on the most recent diagnostic approaches, such as arthroscopy and the recently developed new techniques such as TPLO, guiding the reader in the choice of new solutions for several orthopaedic conditions. The addition of a new Author, Charles De Champ, is a guarantee for the continuous update of this textbook.